This is a beautiful pebbly beach that is a favorite for surfers. The large waves make it perfect for the sport. The beach is wide and the waters completely white which is why it is popular with people who want to enjoy some sunbathing, swimming or a nice picnic. The beach is well equipped and clean and there are food facilities available too! It is all over a good place to spend a nice sunny afternoon. Parking is 1.50 EUR per hour. Bus NSCH till Le Palais. How popular is La Grande Plage? 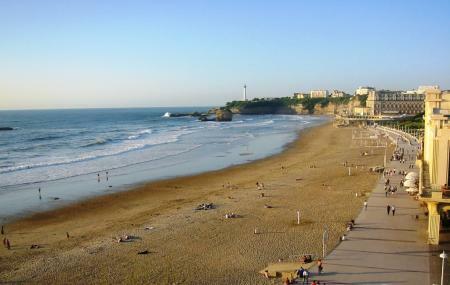 People normally club together Hotel Du Palais and Casino Barriere De Biarritz while planning their visit to La Grande Plage. It's a normal parking place. During our visit in autmn it was easy to finde a parking lot there. Easy to find and affordable right at the beach. Nice large underground parking facility although a little expensive but worth it for the location. Decent sized spaces but a hassle to find a paystation.